See my author video, closed captioned in English, German, and Italian. WORLD WIDE MIND has recently been published in Russian and an Italian edition is forthcoming. What if digital communication felt as real as being touched? This question led Michael Chorost to explore profound new ideas triggered by lab research around the world, and the result is the book you now hold. Marvelous and momentous, World Wide Mind takes mind-to-mind communication out of the realm of science fiction and reveals how we are on the verge of a radical new understanding of human interaction. Chorost himself has computers in his head that enable him to hear: two cochlear implants. Drawing on that experience, he proposes that our Paleolithic bodies and our Pentium chips could be physically merged, and he explores the technologies that could do it. He visits engineers building wearable computers that allow people to be online every waking moment, and scientists working on implanted chips that would let paralysis victims communicate. Entirely new neural interfaces are being developed that let computers read and alter neural activity in unprecedented detail. But we all know how addictive the Internet is. Chorost explains the addiction: he details the biochemistry of what makes you hunger to touch your iPhone and check your email. He proposes how we could design a mind-to-mind technology that would let us reconnect with our bodies and enhance our relationships. With such technologies, we could achieve a collective consciousness – a World Wide Mind. And it would be humankind’s next evolutionary step. With daring and sensitivity, Chorost writes about how he learned how to enhance his relationships by attending workshops teaching the power of touch. He learned how to bring technology and communication together to find true love, and his story shows how we can master technology to make ourselves more human rather than less. 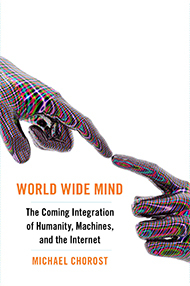 World Wide Mind offers a new understanding of how we communicate, what we need to connect fully with one another, and how our addiction to email and texting can be countered with technologies that put us – literally – in each other’s minds.